I am planning, plotting and possibly scheming. I have two and a half months to implement my plan. I must not fail. Blog land depends on me. I need your help. Over a series of nights for the past couple of weeks I used video editing as a fun stress relief project. Teaching myself the very basics of cutting a movie, I used some of my amateurish footage from Laos. I shot this for fun handheld, never thinking I would use it but for mere memorabilia. I then thought it might make a good atmosphere for my stills and had great fun cutting this. Shot on Canon 5D Mk II, edited in Adobe Premiere. This is ‘Children of Laos’ from the very eastern part of Laos, hmong villages in the mountains close to the borders of Vietnam. I was fortunate to tag along with a journalist friend of mine on a job. Do watch this in HD and full screen, and if you like, read the story below after watching the movie. The temperature hovers around freezing. We are in the town of Nong Hat in the mountains of East Laos. Outside my window a rooster desperately tries to rise the sun at 3am. Some dogs bark and join in. I feel like doing the same as sleep is impossible. I am so cold. We are in a stone guest house with no windows only wooden shutters and it is colder inside than outside. Like the rooster I long for the sun to wake up. When the sun finally rises we are treated to a beautiful morning. Our hostess at the guest house has the fire going in the kitchen, smoke fills the air and our nostrils. Nescafé gets my heart going again and a brisk walk on the street defrosts my bones. We are ready. A few hours later after driving through the most splendorous mountains we arrive at our first village and school. Now, had we landed in a flying saucer, walked up with green skin, two heads and six arms and said "take us to your leader" I doubt we would have caused more commotion. These are very remote and poor villages, some of the children had never seen white fellas like us before. I sit on the ground surrounded by children. Completely stunned by our appearance, very raw emotions from fright to thrilled flicker across their beautiful and very curious faces. My camera is the perfect ice breaker as the results shown on the back screen causes huge surprises and ecstatic joy. This repeats itself at every village, every school and I manage to capture some portraits while the children totally capture my heart. 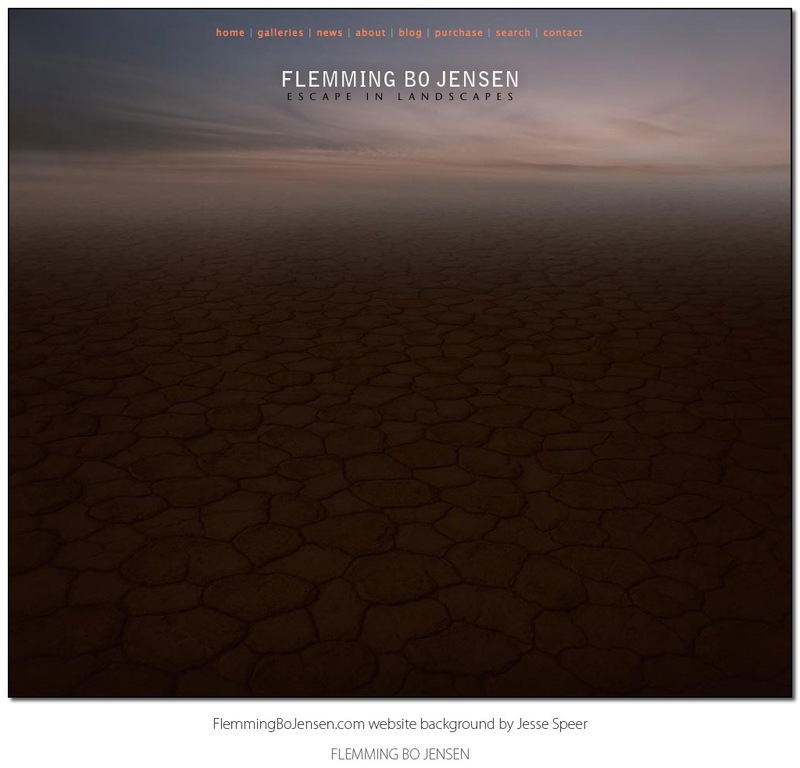 The launch of my new Escape in Landscapes website: www.FlemmingBoJensen.com went extremely well. I am very happy with the feedback and extremely happy with the result. One giant project off the ground, so here’s a glimpse into what is coming up on the blog and my website. In the words of Yoda, "It is the future you see". This blog will be moved in the coming weeks, and integrated into the design of my new website. Hopefully Murphy and his law will look kindly on this. I will be writing a series of Gallery Presentations and tell the stories behind my main galleries. A few videos and the stories behind them may make their way to the blog as well. Actually, very soon. Several new images still to come as I dig a bit deeper in the thousands of images from Nomad Photographer Part I. And of course, don’t worry, the stories behind some of the new images are coming! I am thrilled my stories are liked as I have discovered they are incredibly good stress-relief and fun to write. So I have engaged story telling hyperdrive again, pedal to the metal, well no, but music to the max and pen on paper (yes, most stories are written on paper, works a lot better). A few more words about the design process, a great co-operation between me and Jesse Speer. I chose to involve no one else, I went by my own instincts completely throughout the whole design and programming phase. I poured my heart and soul into this process and wanted no one to interrupt the flow and creative process. Actually no one has seen the website before the launch two days ago and it was a bit nerve wracking launching it. Fortunately, this is one ship that appears to fly not crash! At times it seemed like a mountain too steep to climb, a rock too heavy to push. Five hundred hours of design, programming, developing, adding images, redeveloping old images, writing content, typing meta data, etc., have paid dividends and I am now very happy, relieved and proud to present and launch my entirely new website. FlemmingBoJensen.com Mk III is now live! NB! If you get the old site, reboot your computer, try again. I cannot convey how sweet it is to finally launch this ‘ship’ and I am very pleased with the result. Before you head over there, take a few minutes to read about the site. I have so much to tell, I must try to be brief though. Innovative design by Jesse Speer of WideRange Galleries, read more below. Programming and brilliant CMS by Jack Brauer of WideRange Galleries. More than 300 of my very best fine art images have been carefully selected for the galleries. Large preview images. I want my wide open spaces to really bring you to my world, so most images are 1000 pixels wide. The much-fabled Southwest USA gallery is launched. 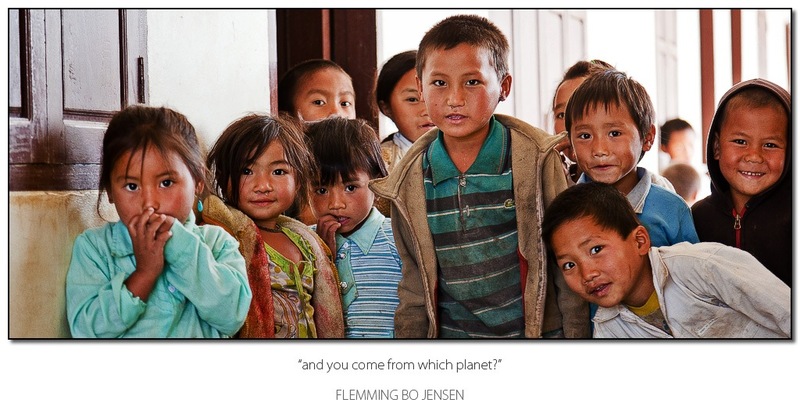 More than 75 new fine art images from USA, Laos, Thailand and Australia from my November 2009 to June 2010 life on the road have been developed and are launching today with the new site. Nearly half of the existing images have been reworked and reprocessed in Photoshop to meet my current standards and processing techniques. New profile, artist statement and bio on the About page. Search index, browse images by search tags, location, themes, colours and still to come, moods. Still much to come in the following months: New images. Integrated WP blog (this blog will move), large stock image archive, wallpapers, calendars and if I can get 30 hours in the day, books! Jesse Speer of WideRange Galleries created the design. Jesse blew my mind with his draft one, he truly captured my vision. Here are some of the words I gave Jesse: Wide Open Space, minimalistic, uncluttered, otherworldly magic look, hyperreality, earth tones, red soil, blue sky, orange sunlight, desert, ocean, waves, dunes, grandscapes, view to infinity, elements that float free, weightless, no limits, no boxes, no lines. His design and the background are created from my images and I love it much and feel it is a work of art in itself so I want to present it here for you to enjoy. This is the otherworldly view to infinity, to a horizon that is not there, to a world you float freely above that draws you in but has no borders, no confinements. New company name, we "Escape in Landscapes"
No, I did not change my name to Luke Skywalker. 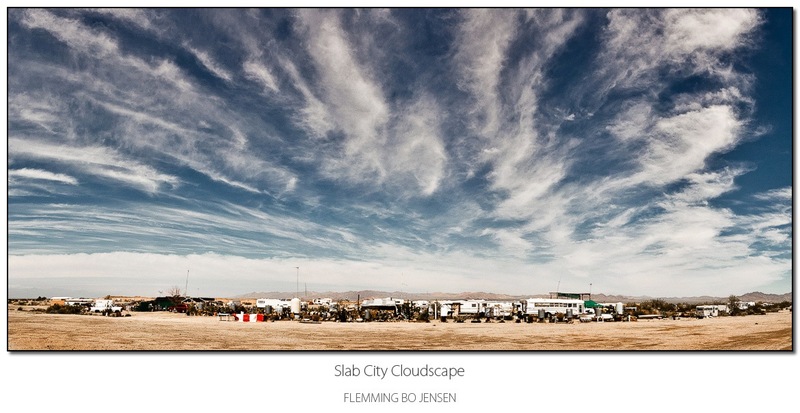 Rather, I have changed my company name to "Flemming Bo Jensen – Escape in Landscapes". The Escape in Landscapes slogan elegantly describes what I am all about and offer. My vision and my otherworldly boundless wide open spaces ensures there is nothing familiar to collapse the dream, allowing you to Escape in Landscapes. Thanks to a dear friend for the words. Yes, the wait is over. The much fabled, much hyped release is reality. Fifty new fine art images from the ethereally beautiful Southwest USA, and still a few to come. Possibly the best work I have ever done. Enjoy this 12,000 km ride through the magnificent southwest. My new website is a WideRange Galleries website using their custom built CMS for photographers. It has been a great, fruitful and creative project working with Jack and Jesse, and I highly recommend WideRange Galleries if you’re looking for a new website. My sincerest thanks to Jack and Jesse for building and designing such a superb website for me. I have gone on for far too long, switch your browser to full screen browsing, head over to FlemmingBoJensen.com and enjoy and escape. I hope you spend some time browsing, then come back here and let me know your thoughts. If you spot any problems, spelling errors, etc. I would also be much obliged if you would inform me. Enjoy! All systems go. Liftoff. Approaching orbit. Escape in Landscapes. "I really love it here. I think the freedom of this place is just so beautiful. To me, I wouldn’t move for $10 million, unless I had to. So I’m contented here in the desert, and I’m living where I want to live. And I think good gets better. And I think those great big tanks there were the sewer plant for the Marine base in World War II"
Some may recognize the words of Leonard Knight from the movie Into The Wild where Chris and Tracy take a walk to Salvation Mountain and meet him. 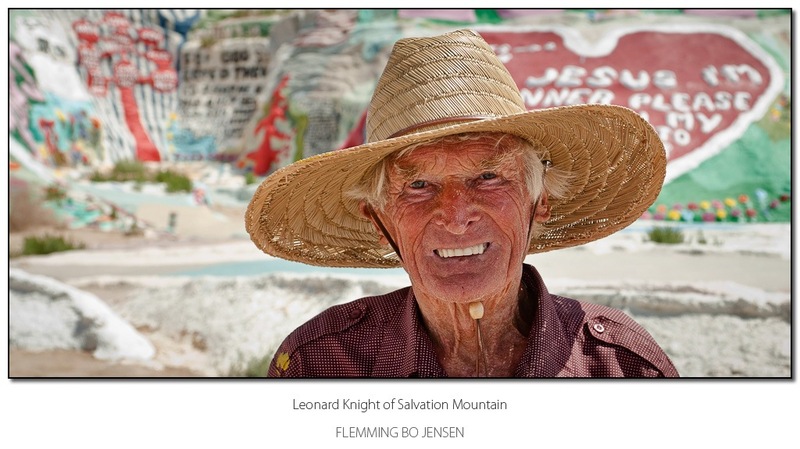 In March I had the pleasure of taking my own walk to Salvation Mountain and meet the legend. Leonard Knight is a joy and an inspiration, just as passionate and quirky in real life as on screen. I spoke with him for a while and his passion for his Salvation Mountain and for his God are very infectious. His work, life, passion and mission is a never ending process of creating Salvation Mountain as a tribute to his God. It’s really just a lot of paint on a mountain built of everything from clay to car doors and telephone poles but his dedication and passion lifts it to something special. It was a slow hot day with few visitors, Leonard tells of days with hundreds of people. The desert sun was scorching, the clouds were spectacular and the wind a warm companion. The air tasted hot and dusty as I ate my lunch sandwich sitting on top of Salvation. Leonard then took me on a tour and gave me a handful of postcards telling me to "spread the love in Denmark, tell people about my work, about love and my mountain". He is a weathered old desert dweller who has seen his fair share of the desert sun. Here’s my portrait of Leonard and part of his desert home. I tend to get somewhat obsessive about my…obsessions one could say. 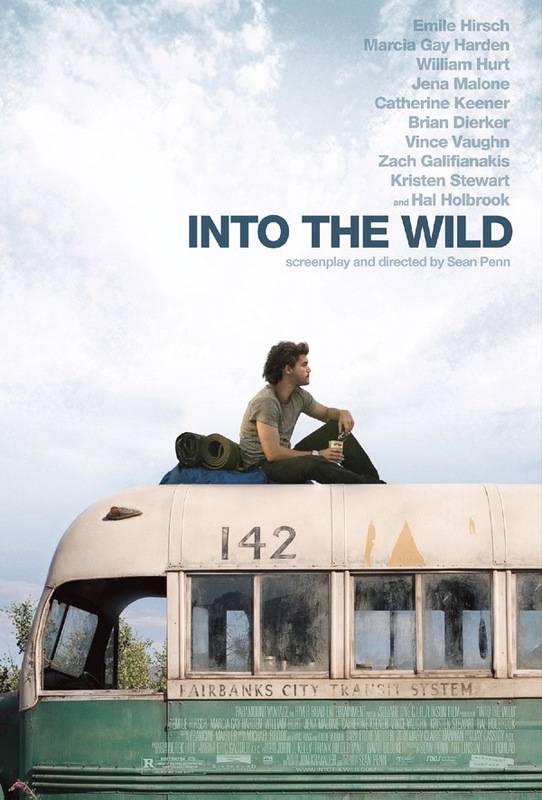 I have over the past two years watched the beautiful movie Into The Wild twenty times, read the moving book ten times and listened to the great Eddie Vedder and Michael Brook soundtracks a million times over. Christopher McCandless’ quest, passion and great adventure somewhat mirrors mine and my feelings, and he completely changed my life post-mortem. Chris, his story, the book, the movie, the soundtrack still means very much to me and there is great strength, comfort and inspiration for me in passionate people like Chris and Leonard. Attempting to slightly moderate my spectacularism (Douglas Coupland’s word for loving extreme situations) I am now attempting to create and live my nomad story, not a copy of the Alexander Supertramp story. Still, I had to visit Slab City and Salvation Mountain when I passed by the Salton Sea back in March. Some elements and arcs of a story came together for me and it was special for me, somewhat moving to be standing there. As if several versions of me caught up and merged into one. Tech: All images including the portrait shot using my Canon 17-40mm L lens, it does actually work as a portrait lens in a pinch and my copy is razor sharp (except for the corners of course). The panorama is stitched. All images have received my ‘harsh desert’ Photoshop process but they needed very little, the conditions here are already very harsh desert! My entirely new website is nearing launch. New design, new images and new features. The very best of my fine art fine art landscape work, at least half of the collection has been re-processed and featuring new images from Thailand, Australia, Laos and 50+ stunning images from Southwest USA. Stay tuned, we launch for the stars within 1-2 weeks if all goes well!